Today was the day I was going to lose my hair. About a week ago, I cut it shorter as I was too tired to take care of the long hair any more. But last night it started falling out into my hand as I tried to wet it down with water, so I knew the end was near. People at the clinic recommended just shaving it when that started happening because they said it was messy and comes out in patches. I knew it was going to be an emotionally trying day, so I called my fun sister over and told her it couldn’t be done without her. I spent most of the morning at Huntsman running tests and such. By 1:00 we were home, met by my darling sister with bags full of scarves, hats and hairless options. After a brief fashion show by Sondra, we browsed through some wig catalogs to find an appropriate wig. Sharon (my darling friends and daily caregiver) was pushing the Jacqlyn Smith wig with the “flirty bangs”, Sondra recommended we not forget the Raquel Welch wig series. We settled on trying some on before buying. With that decision made, Sharon made us a wonderful lunch of whole wheat pasta with pesto, kalmata olives and watermelon. After lunch, I had worked up enough courage to do the deed, so I retrieved a brand new, unopened pair of electric hair clippers I had bought originally to take back to Mexico for my boys’ hair. Conveniently, I had not sent them off with Paul. Sondra retrieved a plastic lawn chair and insisted we do this in the shade under the apple tree. Sharon found me a pillow and an ice pack to sit on during the experience so I could keep working on certain “therapies”. Sondra found a very long orange extension cord and we wrapped a towel around my neck, double ports and all. For added protection, we cut open a white trash bag to protect the port. She shaved me down using a #3 and then used the micro shaver to get a closer shave. I don’t know really what my boys complain about when I give them buzz cuts, because it felt kind of buzzy and sort of good. Now I can tell them I really know what it feels like. Both Sharon and Sondra complimented my head shape (a bit TOO much), which they swear is not deformed in the least. You will just have to take their word for that, because you will never see that for yourself. Once she was done, she washed my head and it felt very mentholated, even though we were just using $1.99 Pantene shampoo. No more need for conditioner and Sharon says she can always use more, so we have a definite plan for the conditioner in my bathroom. Sondra wrapped a t-shirt around my head in the fashion shown me by my terrific mentor, Sarah. At this point I was totally ready to bawl. It is true that I have had a love/hate relationship with my hair over the years, but in reality it has been mostly a love affair. I started to burst into tears and Sondra could see it coming, so she suggested we grab a lawn chair and spend some time outside in the shade to gain some composure. Sharon brought out chocolate and ice waters and took the “after” picture which you will never see. We all sat outside and chatted about family, friends and things happening in our lives. After a pause, Sharon brightly said, “Well girls, this is just like a spa day!” The thought of sitting on an plastic lawn chair, pillow and ice pack getting my hair shaved completely off reminded of no spa experience I’ve ever had. Sharon insisted that we had shopped, had fashion moments, gotten a haricut, had Megan paint my toes the day before, and eaten chocolate while relaxing outside. It was well noted that it was completely FREE! The irony hit me so hard I laughed harder than I have in years. What should have been a day of trauma was a day made bright and fun by my sister and friend. It will be a cherished memory for the rest of my life. Sondra professes to have a secret desire to be Sinead Oconnor (I’ll believe it when I see it), but Sharon was comforted that I had not wanted anyone to be a “shave buddy” and encourage others to share the head shaving experience. Do I feel beautiful? Not quite yet and probably not until I get real hair back, but what a fun day. Just know that you too can have a FREE spa day in the Bentley back yard but that it might involve an ice pack, an extension cord and and electric clippers, but that it will be under the apple tree in the the cool breezes of August. Sharon will throw in some chocolate. It’s on the house. I had to write about this miracle in my life. This is a photo of my new myeloma mentor, Sarah Bertagnole. The Huntsman staff mentioned that there was another mother of six children who had experienced the treatment path of two stem cell transplants. On the first day of my chemo, Sarah walks in the door into the infusion room. She was visiting from Wyoming to do a 3 month checkup and bone marrow biopsy to check for remission. She sat down with me for 45 minutes and shared her story of her family, her diagnosis, and some experiences with her children. She showed me how to tie a turban on my head. She was postive, upbeat, happy and so friendly and loving. She came by on the following day to let me know that she was in full remission and to give me more strength and comfort. I can’t tell you what a miracle this was to meet her. Multiple myeloma is a disease typically contracted by men in their 70’s, not by women of our age. We are exactly the same age. 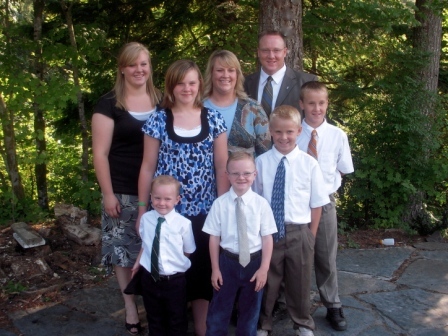 She has six beautiful children and a great husband. Her family lived in Wyoming while she came to Salt Lake to receive treatment and was cared for by her mom. Meeting her was a huge tender mercy from the Lord. She gave me a mental picture and and end state when I was starting on day 1. She gave me strength and encouragement. She radiates a positive energy and joy and she is a true delight to be around. Even in the waiting room, Sharon noticed her and was drawn to her. She started her treatment almost exactly a year ago to the day of my start. She will be my mentor and my support and I can’t believe I am so blessed to be given the opportunity to know her and meet her. Marvelous blessings are being poured out from the Lord to me and to my family. This was a huge one. My heart is full of gratitude for her and to the Lord for letting me meet her on such a critical day and time. What a blessing! I start this blog as woman, wife and mother who is beginning a new family journey. I am 43 and have a darling husband and six beautiful children. Over the summer, I was diagnosed with multiple myeloma, a form of bone cancer. Truly, my first thought as I considered the diagnosis was one word: Family. I love my job and I want to keep doing it. My husband and I enjoy a joyful marriage and we make a great team. I want to share life’s journey with him every step of the way. My children are talented and brilliant. I want to read them bedtime stories, cook them food, help them with homework, send them on missions, plan their weddings and babysit my grandchildren. The immediate and extended family relationships we have bring me the greatest joy in this life I could ever know. And now we begin a new journey joined together by family. So what now? Since our family has been living in Mexico, the diagnosis adds complexity. The treatment path is two bone marrow transplants which requires me to be in a sterile or protected environment for about 6 months. 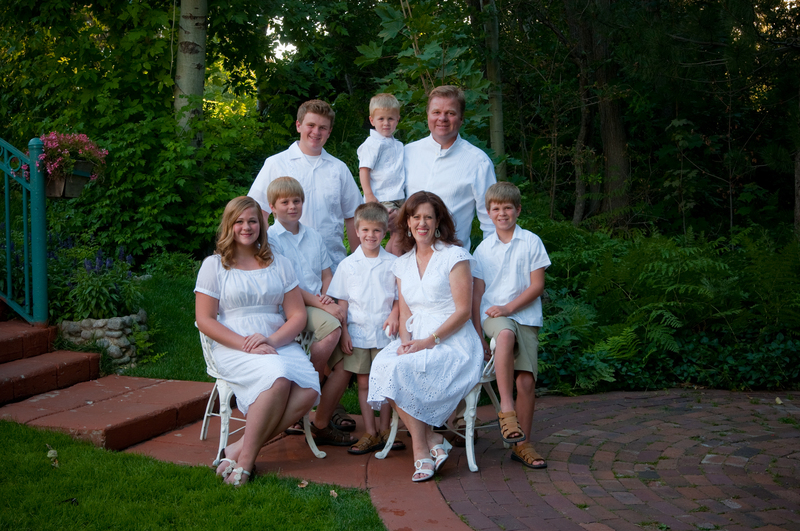 We have decided to have the boys return to Mexico with Dad, while I stay in Utah to receive treatment. Our daughter will stay here with me and attend school here with old friends while she also offers me support. She is a living angel. The outpouring of love and support has been overwhelming. We are so grateful for the encouragement, love, prayers, flowers, food and service. Many kind acts of service have been offered on our behalf, from the opening of the Bentley home to me during treatment, a home and care for my daughter, the kindness and sacrifice of Aunt Tami for the boys in Mexico and every other support. It is a difficult time, but we have the tangible support and guidance of family, our friends and our Father in Heaven as we have made every choice. We are certainly not walking alone. I am passionate about my family. I am sure this blog will be therapy to share ideas on a variety of subjects – faith, food, and family. Together, we will get through the trials and tests of faith. Thank you for your constant support and love. I hope we can serve you as you are serving us during this time.